← Public notice: all endorsements for Lewis Roy Tippens are hereby withdrawn. 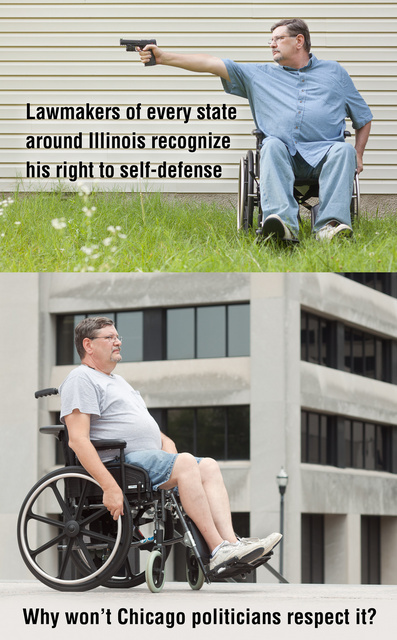 This entry was posted in civil rights, pistol, rkba, self-defense, weapon and tagged Chicago, Illinois. Bookmark the permalink. As a resident of an Illinois city north of Chicago which is not at all gun unfriendly, I would request residents of all US states to boycott and avoid buying products and services from Illinois to demonstrate their disgust over this state’s anti gun policies. There are many targets – United Airlines, Motorola cellphones, Sara Lee foods and much more. The hold that our current anti gun politicians have on this state is precarious – a lousy economy has also resulted from their decisions. Make the economic climate worse enough for them to be voted out, and their gun bans will go with them. The state will bounce back once the Nazis in office are defeated in elections.